Expect to be impressed by this Beazer "Aruba" that shows just like a model home! 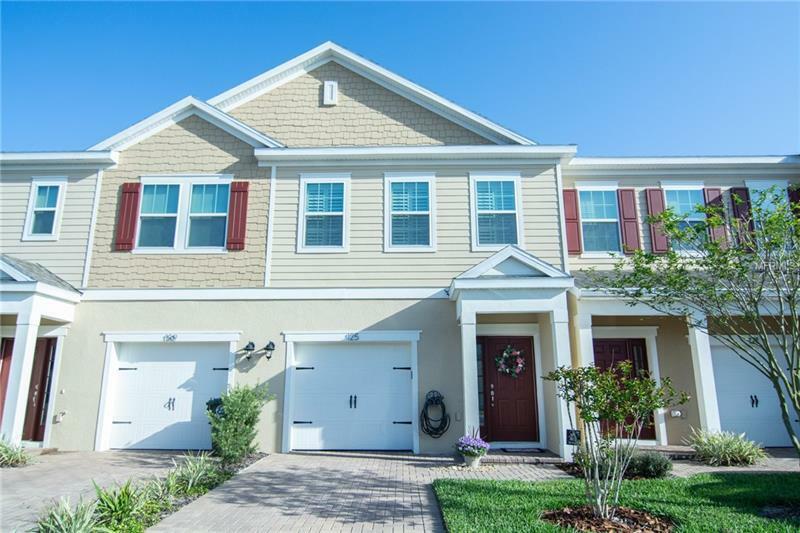 Upon entering the foyer you will fall in love with this tastefully decorated townhome of Mitchell Creek with an Oviedo address! This seller was ahead of the curve with super trending colors, and wood grain design porcelain tile. The kitchen boasts 42'' White cabinets with crown molding, under cabinet lighting with so many color choices, marble tile backsplash with glass tile inlays, granite countertops with large cooking island, upgraded lighting fixtures and Energy Star stainless steel appliances!. The entire downstairs is tiled. With an open concept floor plan, the kitchen overlooks, the dining and living room, onto a screened lanai with a serene view of the water. The second level includes a spacious master with a walk-in closet, and fully upgraded master bath with garden tub, granite counters, dual sinks, linen closet, and upgraded glass shower doors. It has the secondary bedrooms, another upgraded bath, and SS front load washer and dryer on pedestals. There are plantation shutters throughout the entire home, LED lighting w/dimmer switches, a mission style stairwell for lower and upper floors, upgraded ceiling fans w/remotes, 5 1/4" thick baseboards, custom Behr non-toxic paint. A large interior storage closet is a bonus. This home is close to guest parking. This gated community comes with sought after Seminole schools, weed control, irrigation, a community pool, playground, and recreation area. This can be yours today! Pet Restrictions: BUYER TO VERIFY PET RESTRICTIONS WITH HOA, KRISTON NOTTINGHAM AT 407-480-4200 x 1007 ACCESS MANAGEMENT.